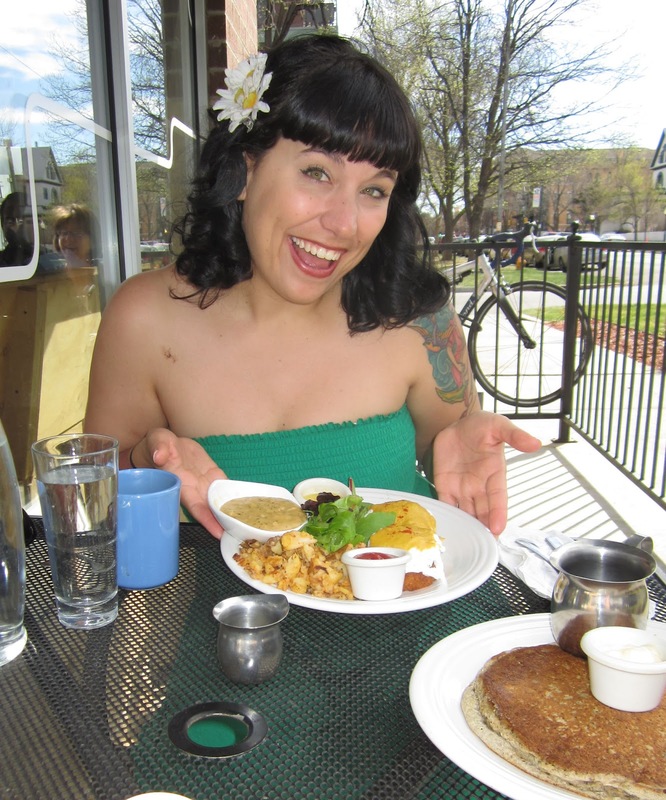 Beth's Super Awesome Blog: Weekend Brunch & Curly curly hairs! Over the weekend I met up with my friend Stacey for a LOVELY lunch at my favorite vegetarian restaurant in Denver - Watercourse. Stacey gave this to me as my birthday gift, and Saturday was the day we decided to go! 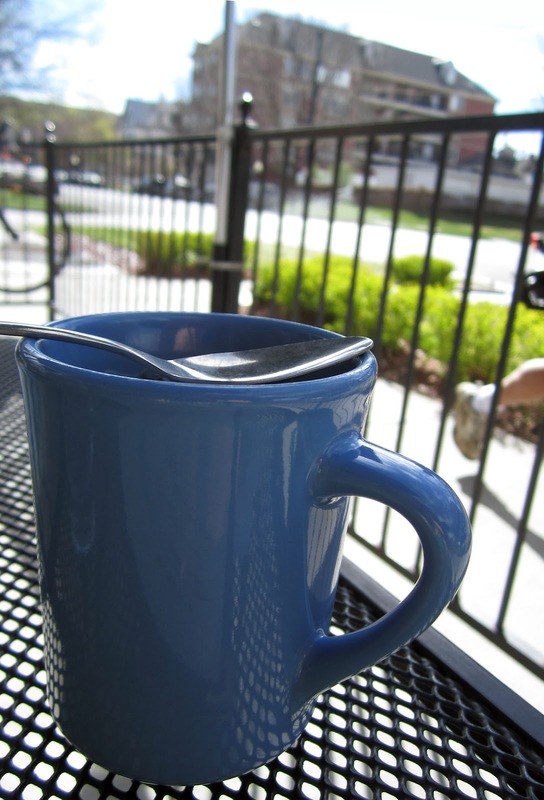 It was an absolutely GORGEOUS day, and since we got there early enough we even got a table outside. I got there a little early, so I ordered a cup of coffee. It totally hit the spot! Stacey with her food! She got the NYC scramble, and we split a DEEEEEElicious pancake! OH so yummy. She got sweet potato home fries too which are the BOMB. Me and my super yummy dish! It was fried polenta topped with poached eggs, a creamy yellow-tomato hollandaise sauce, home fries, arugula salad (with lime vinaigrette dressing), and (of course) a side of vegan gravy. UGH - it was so delicious!! I could eat it every single day. It was on the chef's special page of the menu, which changes seasonally. Also (in case you didn't notice) - I tried something a little different with my hair! And I'm totally LOVING it! It took a bit of time & work, but it was really super easy to do. 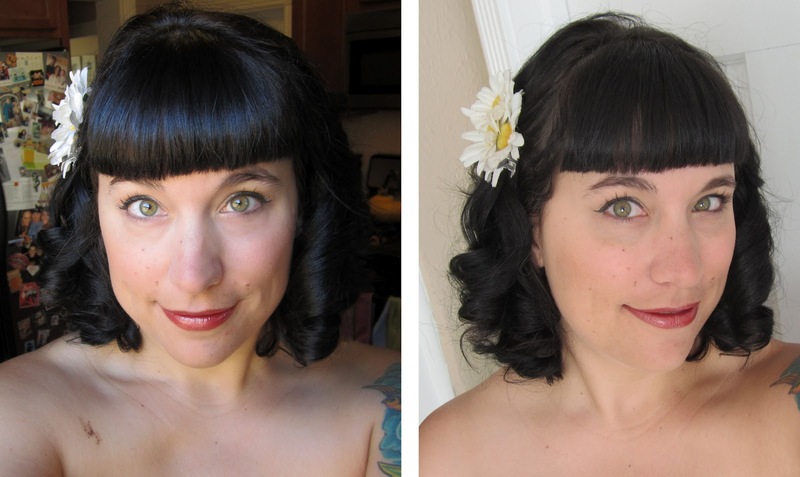 Remember how I posted here about wanting to try some more pin-up girl hairstyle looks? Well, this was one of my first attempts! I just used the little clip-thingies to hold up each curl (I used a smaller curling iron than she does in the video - mine was about 1/2" in diameter), then did a light spray of hairspray over top before removing them when they cooled. They stayed curly ALL DAY! I was thrilled! Later that night I tried the Victory Rolls too, and although they looked super cute, they definitely did not look as awesome as the girls' in the videos. But as they say, practice makes perfect! I'm going to keep trying for sure.